Though jokes can be cracked about Detroit from afar, it doesn't change the fact that there are real people suffering through the downfall of a once proud city. It's terrible. It's sad. 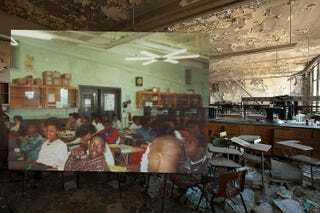 And it doesn't get more heart wrenching than these mashed-up photographs that show what a Detroit High School once looked like, normal and happy, and what it looks like now, abandoned and destroyed. A local Detroit photographer found a treasure trove of old photos of Detroit's now abandoned Cass Tech High School and found former students playing in the gym, studying in the library and roaming the hall ways. You know, the type of things that students do in a school. But they don't do that anymore at Cass Tech High School. The school that once had 5,000 students is now in complete ruins. In fact, it's actually been demolished. But before the demolition of the school, the photographer wanted to compare the glory years of the school's past with its sad deterioration before it disappeared. He photographed the school using the old photos as a guide. An old photo was superimposed onto a new photo, which visually expanded it to include more of the current sad state. The angles were the same, the perspectives were the same and even the focal lengths matched—except everything captured now was in ruins.